The Paul Taylor Dance Company, Heather McGinley, center, performing Taylor’s Cascade at ADF in the DPAC, 7/7/17. Photo: Ben McKeown. Paul Taylor has been one of the greatest dance makers of all time, and for decades his company has performed the works that have poured out of him, and only his works–but even Paul Taylor won’t live forever. What’s a troupe to do, when its leader glides off into the spirit world? What’s the best way to preserve the dances, while carrying on into the future? There’s the Merce Cunningham method, in which the company is closed down, but the dances are licensed and their production controlled by a trust. There’s the Martha Graham method, in which the company continues, keeping the Graham works in repertory, while adding suitable works by other choreographers. Both extremes have merit, and pitfalls. But if the company remains dedicated solely to the works of its founder, after he or she has crossed the bar, sooner rather than later, it will become a mausoleum. Can the founder’s spirit and aesthetic be carried forward via new dances made by other artists? That’s the question for the Paul Taylor Dance Company, which has begun commissioning and performing dances by younger choreographers. This appearance of the company at the American Dance Festival offers the first opportunity in this area for viewers to see how that might work. The July 7 program in the DPAC sandwiched a 2016 dance by Larry Keigwin between two classic Taylor pieces. The July 8 program will feature a Doug Elkins work. It doesn’t look to me like Keigwin is the man to take the mantle. His Rush Hour showed off the extraordinary physical abilities of the dancers, but it lacked the openness, vitality and variation that mark a Taylor work, no matter how minor. Paul Taylor dances make one actively glad to be alive; this particular Keigwin work focused on the struggle of staying alive. No playfulness here. The dancers’ bodies were rigid, their gestures constrained, and almost all the action took place at the same level, although during some of the more aggressive bits, bodies did hit the floor. Maybe the saddest thing was that the dancers were drained of specificity; they were moving ciphers, sexless zeroes–not the rounded human characters who inhabit a Paul Taylor dance. The Paul Taylor Dance Company performing Larry Keigwin’s Rush Hour. Parisa Khobdeh and Michael Trusnovec, front. The American Dance Festival at DPAC, 7/7/17. Photo: Ben McKeown. Rush Hour begins at speed and maintains relentless velocity throughout, racing along to abrasive music by Adam Crystal. There’s not an instant to catch one’s breath, or consider. It’s a portrait, in black and gray, of ruthless competition for space and place. Although impressively energetic and precise, it is cold in affect. And although highly designed–the pattern-making is its greatest strength–it is mechanical, even arbitrary, and damn near humorless. Whereas Taylor makes sequences that seem natural and absolutely necessary, in Rush Hour, everything felt inconsequential, and as if something else could have been substituted with equal effect, as long as it was fast and slick. It was exciting, though, to see all those bodies slicing so close to each other, hurtling around, and the crowd roared as if at a circus. But Rush Hour is a junk food rush, with no real nutrition. The paucity of its movement language, and its lack of musicality, were obvious enough in contrast to the evening’s first work, Taylor’s lovely Cascade (1999), set to portions of three Bach concerti, but were made even more evident by the program’s final dance, the celestial Syzygy from 1987. While you could hardly call Taylor’s style Baroque, he does have a genius for elaboration, for the movement or gesture that continues far beyond the limited pedestrian shorthand utilized by Keigwin. While Taylor has developed a stock of positions, phrases and sequences that he utilizes again and again in very different works, he also goes far and wide to bring back the unexpected, the off-kilter, the odd angle, the silly riff. He surprises you. People sometimes tell me they think Paul Taylor is boring; I think they haven’t been really looking at the work. Paul Taylor Dance Company performing Syzygy, Madelyn Ho leading, at ADF at DPAC, 7/7/17. Photo: Ben McKeown. The company dancers were in rare form last night–the dancing was gorgeous beyond words in Cascade, with George Smallwood really standing out. Parisa Khobdeh’s solo was wondrous, and Michelle Fleet and Michael Trusnovec in the Andante of Concerto no. 7–well, it doesn’t get much better than that. It’s program position tonight will be taken by Book of the Beasts, with a diverse selection of classical music performed on pedal harpsichord. Doug Elkins’ The Weight of Smoke will follow (and will probably include all the humor missing from the Keigwin work), and the evening will close with a reprise of Syzygy, by the same cast the performed it so well last night, led by Madelyn Ho. It would be worth going for that last dance alone. Note that the Saturday night program will begin at 7 p.m.
“…all shine on, like the moon and the stars and the sun…” The Paul Taylor Dance Company orbiting in Taylor’s Syzygy, at the American Dance Festival, 7/7/17. Photo: Ben McKeown. Doug Elkins, who is a 2012 Guggenheim Fellow, gave the best description of artistic deconstruction I’ve ever heard, last night at the ADF gala fête following the festival’s opening night performance of Fräulein Maria by his company, Doug Elkins & Friends. It’s like what a magician does, he said, when he apparently destroys something, and then shows it to you whole. It was this explanation that got him the permissions from Rodgers and Hammerstein he needed in order to use the melodious songs from The Sound of Music in his dance-theater work that re-visions the well-known story with a variety of dance styles and theater techniques, among which it slips like quicksilver. One of the most pleasing sections in this regard is set to “How Do You Solve a Problem Like Maria,” with its charming questions about holding moonbeans, and stopping waves upon the shore. 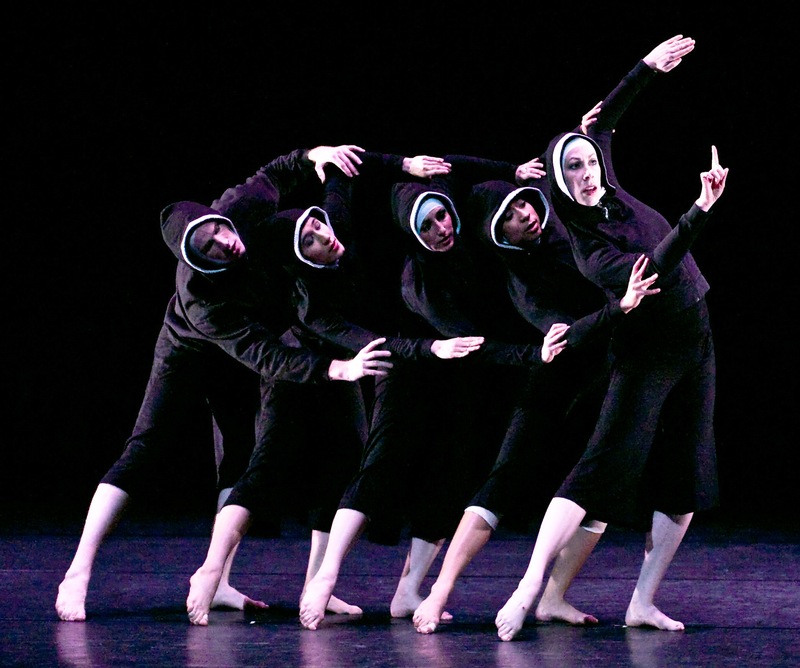 The large group of “nuns” has great fun with depicting the divergent epithets for Maria—and yes, you can evoke a flibbertigibbet in a few swift dance moves—and segues into synchronized, liquid evanescence in the small groups that signal the waves and beams. Fräulein Maria begins in a way that distracts your attention from the virtuosity of the choreography and dancing, though. An emcee/conductor character in a tail-coat, white tie and large, odd shoes whips out a pitch pipe and begins the audience participation period. Do. Re. Mi. It goes on little long for me, and all that carrying on soured on me when the piece was done in Reynolds Theater in 2009. This time, the show paused for a word from its sponsors (Jodee Nimericther gave a happy welcome to all, and with true feeling, dedicated this ADF season to “ever-compassionate” Mary B. Regan, recently retired as director of the NC Arts Council. ), and afterword, the dancers immediately morphed into the mountains so vividly limned by the recorded voice of Richard Rodgers describing the great opening scene of The Sound of Music, where the camera looks down on Julie Andrews’ Maria in this gorgeous setting, zooming in as she runs toward the camera, head back. As Rodgers said, at that moment, “we’re hers.” In Fräulein Maria, when the hills come alive with the sound of music, the dancers burst out of their cloth-covered mountain formations, where the puppet-doll Maria has strolled—and suddenly, there are three Marias, one of them male. Having three dancers to portray Maria works wonderfully, though the mixture of sincerity and burlesquing mockery in their first dance sat a little uneasily. But generally the production is joyous and playful, making smart fun that is fun, and does not wield the sly knife of sarcasm. Marias at work. Photo by Yi-Chun Wu, courtesy of ADF. In other places there must also be special indicators of summer, but in Durham, it is the annual opening of the American Dance Festival that marks the season. Through July, slender dancers of all ages and nationalities will appear like exotic flowers in the cityscape; the gaily-painted “dance buses” will ply between studios on Duke’s campus and the theaters, and a parade of great dance troupes will imprint audiences with their kinetic aesthetics. 2012 is the 79th year for the venerable festival (although not all of those have been in Durham), and the first with Jodee Nimerichter as director-on-her-own, following the retirement of long-time director Charles Reinhart last year. Nimerichter has chosen to begin with a frolic of laughs: tonight’s opening performance will be by Doug Elkins & Friends, who will reprise their take-off on The Sound of Music in the Durham Performing Arts Center (DPAC). Look for my review here tomorrow. 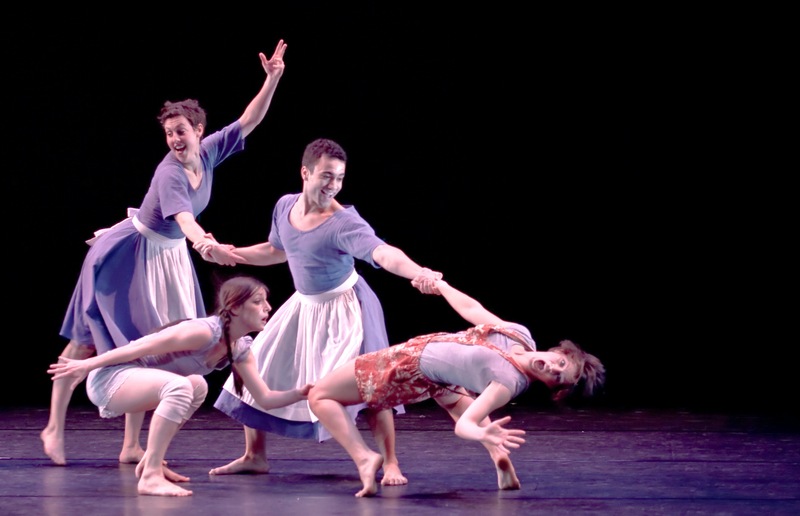 Doug Elkins & Friends in the Nun Quintet scene from “Fraulein Maria.” Photo by Christopher Roesing, courtesy of ADF.